Gerbils are small rodents that originate from arid and desert regions in Africa, Asian and Indian. Most domesticated pet gerbils are the Mongolian variety. Gerbils are kept as pets throughout the world, and thrive in captivity with proper care that includes complete nutrition. A diet that consists of a combination of commercially prepared pellets along with fresh seeds, grains, fruits and vegetables mimics the natural gerbil diet. Gerbils are hardy eaters who gather food during the daytime hours in their natural environments. A variety of grass seeds, berries, nuts and hay such as alfalfa and timothy are staples for wild gerbils. Because of their diverse natural diets of grains, fruits and vegetables, gerbils are easy to feed in captivity. In the wild, gerbils forage for seeds, fruits and grains found in the environment. 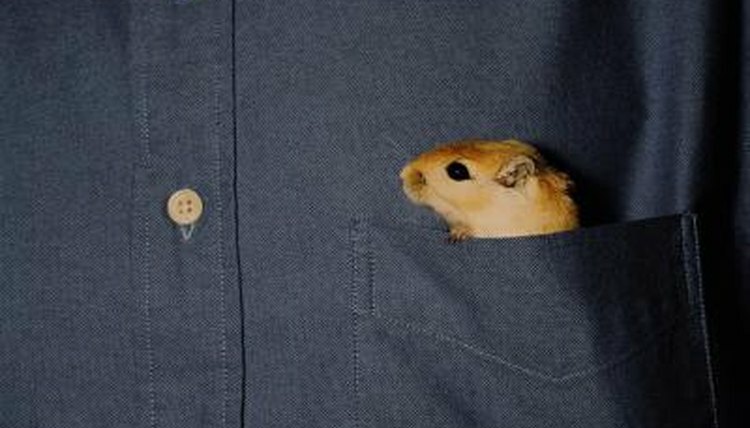 However, gerbil owners don't have to search in nature to provide a nutritionally-balanced diet for these tiny pets. Pellets that are specially formulated for gerbils are available at most pet shops and retail stores with pet sections. These pellets contain a variety of grain and seed ingredients that are ground together to form small pieces of food just right for gerbils' small mouths. They are also fortified with necessary fats, proteins, vitamins and minerals to provide a balanced diet. Though gerbils usually enjoy these pellets that are formulated for their tastes and nutritional needs, these hardy rodents enjoy variety just like they do in the wild. Offering a mix of seeds, grains, fruits and vegetables will keep your pets satisfied. Because gerbils love variety and seeds, a commercial mixture, often called gerbil mix, is ideal. These prepackaged seeds often have numerous varieties, including sunflower, pumpkin, alfalfa, flax and wheat. Some even contain cereal for added nutritional value. Gerbils often prefer larger seeds such as pumpkin and sunflower, and gradually nibble around the smaller seeds in the mix after they have devoured their favorites. Fresh fruits and vegetables are also mainstays of the gerbil diet. They enjoy almost any type, because in the wild gerbils readily have access to leafy greens, berries and some root vegetables. Carrots, lettuce and broccoli are low-fat choices that are good for gerbils to eat. Though they also enjoy fruits such bananas, peaches and even dried fruit, too many of these sugary treats can lead to obesity and health concerns. Therefore, gerbils do best when their primary diet is supplemented with only small pieces of fruits and vegetables no more than once a day. Removing uneaten portions promptly after mealtimes will prevent spoilage. Gerbils love to eat, though in the wild they don't have unlimited access to food. Because they have tendencies to eat indiscriminately in captivity, certain foods should be limited to keep these small rodents from become overweight or even obese. Give treats such as sunflower seeds, peanuts, commercial cereals and even fruit in moderation, as these foods can be fattening. Gerbils also prefer these tasty morsels to other more nutritious grains, so limiting them will encourage these little pets to eat what is best for them. Never give foods that pose the risk of choking, such as hard, dried beans or large pieces of hard vegetables. In addition, always avoid junk food such as candy, chocolate, cakes and cookies. Finally, some vegetables such as onions, cabbage and potatoes pose the threat of gastric problems in gerbils, so do not give these to your little pets. Just like any animal small or large, gerbils enjoy an ample supply of water. Whether provided in a water bottle hung from the corner of the cage or in a sturdy bowl, these small rodents always appreciate plenty of clean, fresh water.